The Whole Booke of Psalmes was one of the most published and widely read books of early modern England, running to over 1000 editions between the 1570s and the early eighteenth century. It offered all of the Psalms paraphrased in verse with appropriate tunes, together with an assortment of other scriptural and non-scriptual hymns, and prose prayers for domestic use. Because the Elizabethan Church rapidly and pervasively (if unofficially) adopted this metrical psalter for congregational singing, and because it had in practical terms no rivals for church use until the end of the seventeenth century, essentially the entire conforming population of early modern England after 1570 would have been familiar with its psalms and hymns as elements of both public worship and private devotion. Yet, despite the significant impact of The Whole Booke of Psalmes upon English culture and literature, this is the first book-length study of it, and the first sustained critical examination of the texts of which it comprises. In large part this neglect is due to the reputation it gained after the mid-seventeenth century as a work of poor poetry mainly valued by vulgar and/or sectarian audiences. This later reception, however, was the product of not only changing literary tastes but an ideological desire to reshape the history of the Reformation. 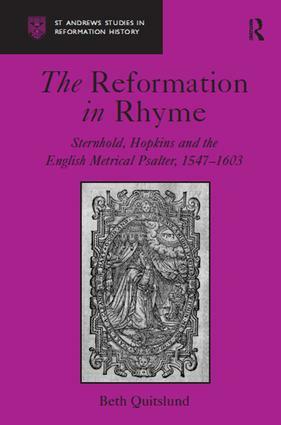 This study focuses on the actual aims of its authors and editors over the course of its gradual composition during the tumultuous religious changes of the mid-sixteenth century, and recovers its significant influence on the English church and literary practice. By tracing the ways in which historical contingency, religious fervor and the print marketplace together created and were changed by one of the most successful books of English verse ever printed, this study opens a new window through which to view the intellectual and ecclesiastical culture of Tudor England. It also shows how, in metrical psalmody, Protestant reformers discovered what turned out to be a uniquely flexible and effective instrument for advancing their vision of a godly society. Contents: Introduction; Thomas Sternhold's Certayne Psalmes 1547-1549; Al Such Psalmes and the zeal for Biblical verse 1549-1553; Psalmes of Dauid among a scattered flock 1554-1558; The Anglo-Genevan metrical psalter 1556-1560; The Whole Book of Psalmes and the Elizabethan settlement 1559-1562 and after; The Whole Book of Psalmes in the life of the Elizabethan church 1562-1603; Appendices; Bibliography; Indexes.